I was talking last week about how some baked salmon I made turned out fabulous, and I was pleased because salmon is my least favorite seafood (and I’m not picky)! We had two salmon fillets with skin, in the freezer that I’d thawed (pretty sure the skin keeps all the fat and moisture in, even though it grosses me out-but I’m working on that!). I put them skin side down in a glass 8×8 baking dish that I’d rubbed a bit of olive oil on, and generously sprinkled them both with salt and pepper. They were done in about 7 minutes. That was it. I thought I’d try baking them with no oil or fat, since they’re fatty by nature, and it worked great. Only when I put it on my plate, did I drizzle a bit of olive oil on the fillet (not cooked, so still has the health benefits). So good! Sometimes, less is more. I paired them with some thyme roasted carrots I’d thrown in the oven, for dinner and a couple of berries. I had plenty of carrots leftover to bring in my lunches throughout the week, and Seth used the other salmon fillet in a salad Sunday night. Leftovers rock! 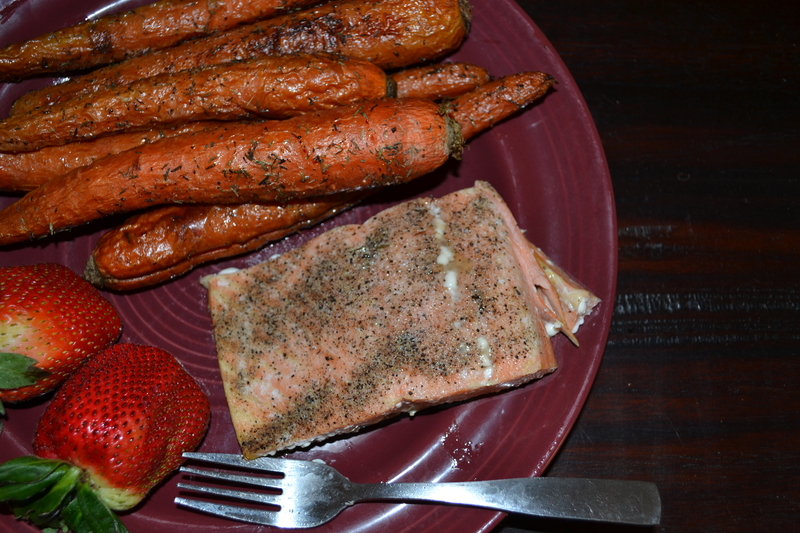 This entry was posted in Recipes and tagged Carrots, health, Leftovers, Paleo, Quick Dinner, Salmon, Salt and Pepper, Seafood, Strawberries, Thyme by livinglikelinds. Bookmark the permalink. YUM, we eat salmon at least once a week and we love it. We always pair it with steamed broccoli with fresh lemon juice and it’s sooooo good!!!!! Hmm I am not a huge salmon fan(In fact I would go with don’t really like it at all)…but because of the health benefits…I may try this!! !